So, while I’ve been piddling around over here, work, gym, eat, work, bud, etc… my sis Jenn has realised one of her life’s ambitions this week, she’s playing in the Scotties Tournament of Hearts in Regina, Canada! Of course it’s not the trip to Regina that has been her dream all these years, it’s the bonspiel! Essentially the Canadian Women’s Curling Championship, the ‘Scott’ has been a staple in our household growing up, so you can imagine how excited we all are for her. The fifth member on Manitoba’s Jones rink, one of her highlights I’m sure, has been helping her teammate Jill Officer win the Hot Shot Competition. I’m sure Jill won’t mind giving Jenn the odd lift home from the club in her new car! Guess we’re missing out on Nic n Cher on Tour in Effin Regina this time around. Hi. Im a Big fan of Jennifer Jones. I would Love if you could send me an Autographed Picture of her. Im only 13 and Shes already my Idol. i want to be like her when I grow up. If you could email me, and i would send u my adress. to send me a signed picture. I would be the Happiest girl Ever. Did you see the girls win the Scot on the weekend? 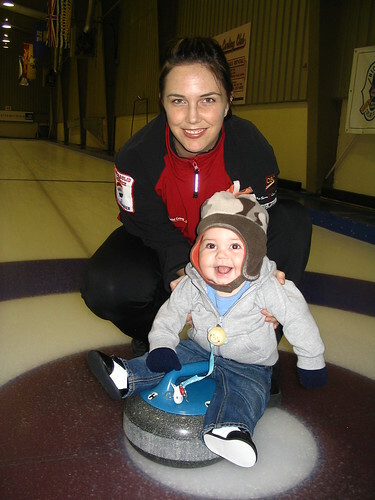 They are heading to the Women’s World Curling Championships in a couple of weeks. I’ll see what I can do about your autographed picture.